As Director P.J. Moynihan clarifies, he is not categorically opposed to medication and psychiatry, but he anticipates this work will broaden the social dialogue about alternative approaches to mental health and allow for burgeoning human rights. In this rich documentary, Moynihan invites us to join and consider the detailed journeys of three individuals who live in and out of altered conditions or "extreme states of consciousness." As we follow Oryx Cohen, Jen Constantine and Dan Sullivan, we experience their unique discourses surviving on and off medications and in and out of hospitals, and "being captured by the mental health system." We also learn about support for pharmaceutical detoxification, how many individuals exist in the shadows and stigma of mental health counter culture, and the growing peer support movement that continues to evolve from each of these proficiencies. Moynihan's careful portrayal of each individual's experiences over a number of years reminds me of Raihkel and Garriott's (2015) fluid depiction of disability when they speak of "addiction trajectories," and how these lives are not neat and tidy linear paths, but more eliptical and vacillating concentric circles. Individuals with changing mental health circumstances may have days, months and years with non-linear trajectories of functioning and acceptance. 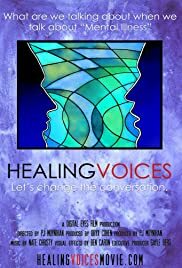 As with addiction, "Healing Voices" reminds us there are epistemic trajectories operating upon atypical mental health minds, which are drawn by categories and concepts of mental health, that can change across time and move through established spheres. Given support and an ability to reject the terminal sentence of a biologically diseased brain, however, many people can and do create meaning in their lives. Moynihan's lens considers how alternative narratives came forth through the Hearing Voices Network movement, a growing community which provided a venue for "extreme experiences" of voices, visions or olfactory phenomena to be examined and accepted, rather than pathologized, cured or tranquilized. In showing this network and scores of individuals who entered dark basements to start the dialogue, the film illuminates how talking about these sensations influenced and celebrated a new form of mental health "recovery," one that comprises hope, acceptance, the option of pharmaceutical detoxification and peer-based supports. In a March 8th on-campus screening at Stony Brook University, Moynihan told audience members he himself has been in rooms with people in extreme states and realizes there are times when a small dose of medication might be warranted to ease agitation and confusion until a person can regain a lesser degree of danger. "It is what we do beyond that, that matters," Moynihan noted, citing peer respite programs and service users acting as supports to each other as simple ways to expand and nuance mental health care. Moynihan is not a psychiatric service user, survivor or mental health provider himself. He is a documentary film producer, one whose done a lot of projects about baseball, but who became interested in how large the Hearing Voices and peer respite movements were growing, allowing survivors to come out of the shadows. The film is organized into four parts, each part making a new point in the "healing movement" conversation. In part 1, "Canaries in a Coal Mine," we revisit urgent press conferences held at the White House during the Obama era, which cited the overwhelming statistics of mental illness [sic]. At a later point in the film, the word "illness" is interrogated, highlighting the fact that it is not just the treatment of madness that society has bought into, but the naming of it, as well. "We bought this," the narrator Moynihan states. "But what of the shadows? What of the canaries in the coal mine?" The lines of chemistry for pharmaceutical and recreational drugs are in reality blurred without most of society even knowing this. During many points in the film, Moynihan interjects interviews with service providers who interrogate labels and cures in earnest. "Treatment is determined on how you conceive of 'the mad,' " Dr. Robert Whitaker, author of Anatomy of an Epidemic (2010) reminds viewers. "Because we fear them, we don't listen." Instead, he argues, a better approach would be to take instruction from the Quakers who considered mad people as brethren. In Part II, The Mythology of Mental Illness, the project considers a "common sense rebellion." Participants argue that conditions like Oppositional Defiance Disorder or Attention Deficit Hyperactivity Disorder may have gained momentum as a result of the need to silence activists and agitators. Changes to the DSM seemed to mirror times of growing political opposition and activism and this may not be coincidental. This section also showcases workshops for harm reduction approaches to coming off psychotropic drugs. Freedom Center group organizers, themselves "survivors of psychiatry," note that it was typically taboo thinking about medications without a psychiatrist in the room. In Part III, There are Alternatives, a psychiatric nurse reflects on her own professional training, which explicitly forbade her from talking to mental patients about their atypical voices. Yet, at Jen's house, now a survivor and mother of two, inside the basement, down in the dark, people started talking about their voices. All the while considering a new type of canary, that of the peer support individual, the film allows for the continued quest for answers. Whether psychoses or altered states result from early childhood traumatic events or a reaction to emotions, mental health could be related to problems of people, rather than just a discreet pathology, Whitaker suggests. Like the many paths to madness, there may be many paths to treatment and recovery or many paths to management and living that do not rely on fixing. PART IV, Times of Quiet Desperation, examines the psychology of oppression. "Forcing people to fit in…it's going to create all kinds of people in a lot of pain, a lot of misery," Dan, a gay man with a number of friends in his head warns. Dan, who has embraced his sexuality, his mental disability and his voices questions labels. "What is creating the label?" Loud desperation, he figures. One audience member at the screening, who identified himself as an occupational therapist for people with mental disabilities, applauded the film but noted there remains a delicate balance between relinquishing medications entirely on the one hand and the continued need for medications for some individuals on the other. "That is true and I take that very seriously," Moynihan agreed. "However, we can't continue solely mandating medication for everyone all the time." Moynihan has nothing definitive slated beyond "Healing Voices" in terms of a next mental health project, but the home video release of this film is May 2, 2017, after which its producers will pursue broadcast distribution and continue to screen the film. When another audience member noted that this project just scratches the surface, there are still many more stories to offer, including additional mental disabilities and more stories of people of color and gender inequities, Moynihan conceded. "This is just one small worm hole, I've gone down," he said. "I hope it opens up more." This film is a useful opening and addition to undergraduate and graduate bioethics, psychology, psychiatry, social work and critical disability studies courses. It encourages people to consider whether there are discreet illnesses in mental health and what the biology of disorders means. Perhaps the penultimate contribution to social welfare and human rights' conversations everywhere, however, can be summarized by Dan Sullivan in the film when he says, "it is those messages about being broken that really need fixing." Raikhel, E., Garriott, W. (2013). Addiction trajectories. Durham: Duke University Press. Whitaker, R. (2010). Anatomy of an epidemic: magic bullets, psychiatric drugs, and the astonishing rise of mental illness in America. New York: Crown Publishers.